England produced a 24-point second-half blitz to blow away a feeble Australia and end their autumn campaign on a high. Jonny May’s predatory try had given Eddie Jones’s men an early lead before Israel Folau’s fine score and Matt Toomua’s conversion and two penalties made it 13-13 at the break. But tries from Elliot Daly, Joe Cokanasiga and Owen Farrell were fitting reward for a vastly improved second-half display as the Wallabies fell to their sixth defeat on the bounce in this once-tight rivalry. Never before have England enjoyed a run of success like that in this fixture but Australia, stripped of their talisman David Pocock, were a shadow of the team that dumped the hosts out of their own World Cup here three years ago. After a dismal Six Nations and poor summer a November that has seen three wins and a one-point defeat by the All Blacks represents a recovery for Jones. England have still only played well in patches, and remain a work in progress with the next World Cup just 10 months away. But with newcomers Mark Wilson and Ben Moon once again impressing and Jamie George justifying his selection ahead of Dylan Hartley, England can claim to be moving slowly forward rather than flatlining. Fifteen years on from their famous extra-time win in the World Cup final, England were on the board within two minutes, shoving the Wallabies scrum backwards before Wilson picked up from the base and fed Ben Youngs outside him to send May scampering into the right-hand corner. Farrell’s conversion from the touchline and a more straightforward penalty were split by a penalty from Toomua, but it was a disjointed contest – Australia a mess at the breakdown, England wasteful with the subsequent openings. The malaise spread to the officials, referee Jaco Peyper missing a clear forward pass as Dane Haylett-Petty profited from Samu Kerevi’s break down the right to flop over in the corner, finally going to the TMO only as Toomua was on the point of kicking the conversion. Farrell extended the lead to 13-3 with his second penalty after Daly was dumped by Izack Rodda, but from nowhere Australia struck back. Folau made initial progress down the left and when the ball was recycled, cut a sweet line back against the grain to slice and step through a wrong-footed English defence and race under the posts. And the Wallabies were level when England went offside as Kerevi went on the charge again, Toomua slotting the penalty when Farrell should arguably have been sent to the sin-bin for a shoulder-charge on Rodda as he cantered towards the line. Peyper ruled that Australian lock had also dropped his shoulder into the tackle but England could have had few complaints had the South African official awarded a penalty try. Jones sent England out with fire in their bellies and the dividend came almost immediately – Farrell dummying and then off-loading to a charging Daly before the full-back accelerated away from Will Genia and Haylett-Petty on a curving run. Farrell drilled over the conversion for 20-13, and with Kyle Sinkler carrying powerfully up the middle the crowd sat back and waited for the flagging visitors to be put to the sword. England at last hit their straps. Cokanasiga smashed his way through a dazed Haylett-Petty and cantered away for his second international try in two starts to bulldoze open the floodgates. He almost bettered that a few moments later, seizing a high ball and spinning out of the tackle before thundering through two more and on another 40 metres before skipper Michael Hooper’s desperate tackle on the try-line just held him up. Farrell’s third penalty made it 30-13 with 15 minutes still to come, and England thought they had their fourth try when they counter-attacked from near their own line for May to kick on and dive on the loose ball, only for TMO Marius Jonker to correctly rule that Henry Slade’s clearing kick had landed on the touchline. It was a brief respite. Farrell exploited a gaping hole in the visitors’ defence created by a thumping run from the returning Manu Tuilagi to cap a period of intense pressure and banged over the conversion for his 22nd point. Folau’s second try at the death after Haylett-Petty’s break did little to hide the problems piling up for Michael Cheika. The tight-head prop has made that position his own this autumn and contributed 12 rumbustious carries in his 60-odd minutes on the pitch, a perpetual threat even when England were struggling to find momentum. 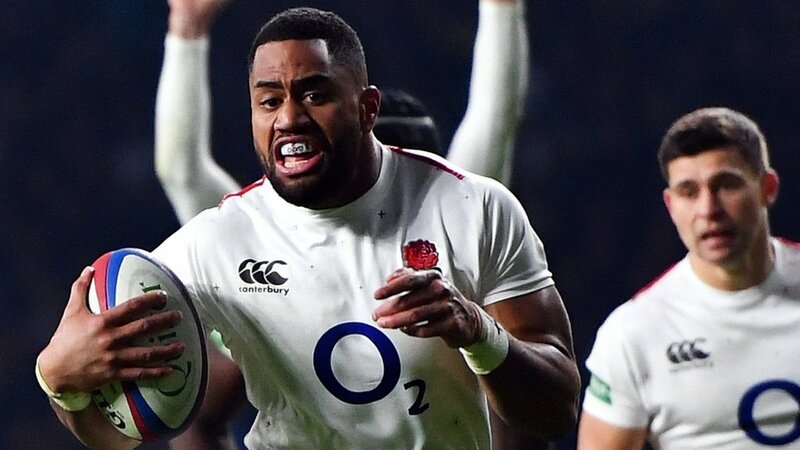 England: 15-Daly, 14-Cokanasiga, 13-Slade, 12-Te’o, 11-May, 10-Farrell (captain), 9-Youngs; 1-Moon, 2-George, 3-Sinkler, 4-Itoje, 5-Lawes, 6-Shields, 7-Underhill, 8-Wilson. Replacements: 16-Hartley, 17-Hepburn, 18-Williams, 19-Ewels, 20-Hughes, 21-Wigglesworth, 22-Ford, 23-Tuilagi. Australia: 15-Folau, 14-Haylett-Petty, 13-Kerevi, 12-Foley, 11-Maddocks, 10-To’omua, 9-Genia; 1-Sio, 2-Latu, 3-Kepu, 4-Rodda, 5-Coleman, 6-Dempsey, 7-Hooper (captain), 8-Samu. Replacements: 16-Polota-Nau, 17-Ainsley, 18-Alaalatoa, 19-Simmons, 20-Hanigan, 21-Phipps, 22-Naivalu, 23-Koroibete.